Masked for centuries by the soot of candles and lately by scaffolding, the mosaics of Bethlehem's Church of the Nativity have been restored to their Crusader-era splendour in time for Christmas. 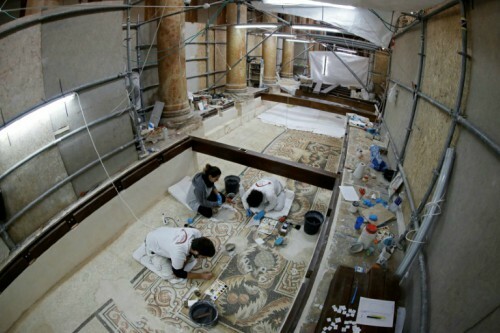 Over the past 15 months, experts have cleaned and repaired surviving fragments of the 12th century masterworks, preserving 1,345 square feet (125 square metres) of what was once 21,528 square feet (2,000 square metres) of glittering gold and glass. The rest has been eaten away by wear, humidity, wars and earthquakes. 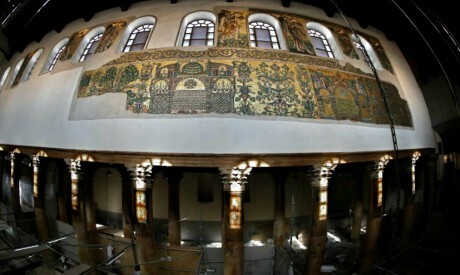 Now the restored remains shine against the white walls above the heads of visitors to the church in the Israeli-occupied West Bank city of Bethlehem that marks the traditional birthplace of Jesus. Overlooking the nave are seven angels framed in gold who appear to have landed on a carpet of vivid green grass. Each is placed between windows symbolising divine light. One of the angels was discovered during the restoration work beneath a layer of plaster. "These mosaics are made of gold leaf placed between two glass plates," Marcello Piacenti, who supervises the work on behalf of his Italian family restoration firm Piacenti, told AFP. "Only faces and limbs are drawn with small pieces of stone." One of the partially destroyed angel figures was restored using different materials to the original so as not to mislead future archaeologists. Ibrahim Abed Rabbo, a Palestinian Authority (PA) engineer said the transformation caused by the restoration is striking. "When you entered the church before, you could not even make out that there were mosaics, it was so black," he said. In a rarity for the period, the works were signed by the craftsmen responsible, Abed Rabbo said. In the choir of the church, the visitor can now see an image of Saint Thomas, incredulous at the resurrection, poking his finger into Christ's wound from his crucifixion. Elsewhere there is the triumphal entry of Jesus into Jerusalem on Palm Sunday. "It's meticulously detailed, it gives the impression of being brand new," said Patricia Lieby, 44, a French tourist visiting the church for the first time. 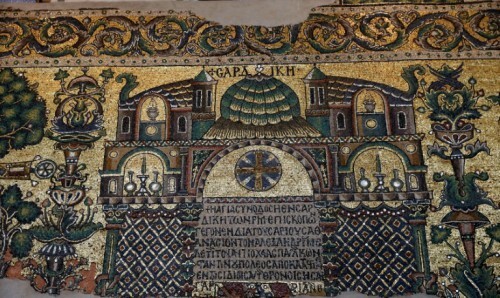 "I have never seen a mosaic like this outside Jerusalem, it's sublime." Father Asbed Balian is the senior cleric of the Armenian church at the basilica, where property rights are shared with the Roman Catholic and Greek Orthodox faiths. After seeing the completed restoration, he said, he was "stunned". "Spiritually, we feel more exalted," he added. 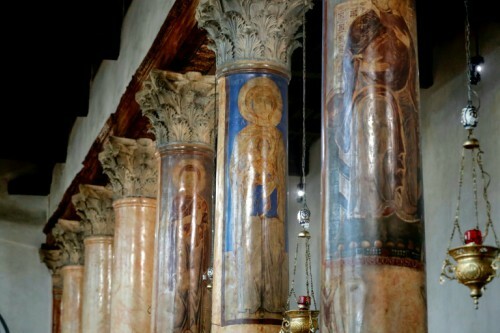 On the nave walls, the restorers also gave renewed life to paintings dating from 1127 and the end of the 12th century when wealthy pilgrims commissioned artists to paint their family or home region saints, for display in the holy site. "These portraits were barely distinguishable, blackened by the years," Piacenti said. Now their silhouettes stand out against the church's reddish columns, although the faces were erased after the Muslim conquest, in keeping with the Islamic ban on portrayal of the human form. The first Church of the Nativity was built in the fourth century by Roman Emperor Constantine and his mother Helene. That original structure was believed to have been destroyed by fire but Piacenti said no trace of burning was found during the restoration work, leading him to think an earthquake was a more likely cause. The Byzantines rebuilt the basilica in the sixth century and the Crusaders later added to it. Due to disagreements between the three faiths responsible for the site, the building had gone unrepaired since the middle of the 19th century. In 2002, bullet holes pocked the front of the church after a five-week Israeli army siege when some 100 Palestinians took refuge inside. When the Palestinian Authority began renovations in 2013, "the basilica was in danger", PA restoration consultant Afif Tweme said. Scaffolding remains in part of the choir stalls as restorers work, inch by inch, on floor mosaics, hidden from public view by plywood screens. "It's very special, because of the location," said Piacenti. "Sometimes I have to force them (workers) to leave" at the end of the day. Tweme said the restoration would "influence tourism for sure". He hopes the economic benefits will "persuade more of Bethlehem's dwindling local Christian population to stay in the city rather than move away".